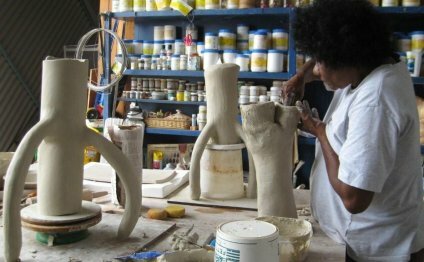 Pottery workshops at MudFire bring nationally and internationally known pottery and clay artists to Atlanta for inspirational and educational artists workshops in our sunlit loft studio. Our focus is to bring you superb instruction and inspiration at a reasonable cost. Visit friends and family, explore Atlanta/Decatur's dining and shopping, catch a play at a local theatre, and spend a few days with other clay enthusiasts! We generally try to arrange for our visiting artists to present a free slideshow and talk the evening before the workshop begins. These events are free and open to the public, presented as a service to the community. Check each workshop page for slideshow info. Workshop registration is available by credit card on this site, or by phone at 404-377-8033. To purchase tickets by check please call to reserve first. Please refer to our workshop policies page for information on cancellation, hours, transfers and payment. Please see our lodging and travel page here. Most of our workshops sell out, please purchase your tickets early if you are interested. Please call if you would like to take advantage of our pay-as-you-go plan for making multiple reservations.